It is a riddle not yet solved. Why was at least one shooter firing at a helicopter, police, and drivers in Texas on this Memorial Day weekend? On Sunday, May 29, 2016, on the west side of Houston, Texas, an active shooter began firing shots around 10 a.m. at 13200 Memorial Drive. 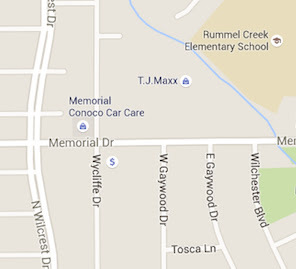 The media said this was "near Wilcrest Drive." But actually, that is just the nearest large cross street. The shootings were concentrated at the corner of Memorial Drive and Wycliffe. 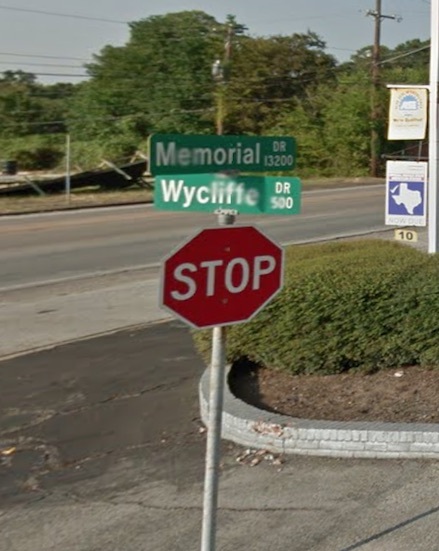 In English the meaning of the name Wycliffe is from the "white cliff." Now recorded in the "modern" spellings of Wickliffe, Wycliff, and Wycliffe, this is one of the most famous of all surnames in Christian history. One of the earliest nameholders being John Wycliff, the religious reformer and arguably the first English protestant. The surname originates from the village of Wycliffe, in the far north west corner of the county of Yorkshire, near Barnard Castle on the River Tees. The village is ancient, being recorded in the famous Domesday Book of 1086, the first known gazetter of land ownership anywhere in the world. This recording was in the spelling of "Witclive," meaning "The white cliff," the area being famous for its limestone. Source. Law enforcement officers said the shootings left two people dead, including one suspect, and several others injured. Among the injured were four bystanders and two officers. An alleged second shooter is in police custody. That unnamed person was also injured and taken to the hospital in critical condition. Investigators said the two suspects are either Hispanic or Caucasian males. One "white" man covered in tattoos was seen by local residents holding his hands in the air. One male victim, in his 50s, was found shot to death in a vehicle. Three other people were wounded by the gunmen and taken to area hospitals in unknown condition. The shooters did hit a police helicopter five times, apparently with AR15s. A fire at a nearby gas station was sparked by a bullet fired during the shooting. The focus of the shooting was at Memorial Drive Tire and Auto Center. The Houston Police Department said there is no motive known for the shootings. "Police sources have identified the suspect in Sunday’s deadly west Houston shooting as Dionisio Garza III." Rather than a day of solemnity, Memorial Day is an excuse for letting loose. Louisiana is a good example. Distracted, impaired, drunk; that one state had 9 fatal crashes with 14 deaths total over the weekend. I'm sure other states experienced an increase in deaths over the HOLI-day weekend. Checkout Breitbart's headline "Chicago’s Bloody Memorial Day: 66 Shot, 6 Killed". Interesting, 666, hmmm. Here's a Memorial Day massacre from 1937 where Chicago Police shot and killed ten unarmed labor demonstrators. A collective sacrifice? Falling for the Fallen between Beltane and Litha.